The Bellemont's bar and lounge has gone by other names, most recently Brella's. In 1957 it was The Planters' Room. The black and white photos above and the other historic shots here are from Baton Rouge library archives, dug up by Becky. In the above case, an article/brochure effused praise of the rooms' Old World-meets-New World decor, murals, furnishings, the chandelier imported from Czechoslovakia, and yadda. I regret not looking behind the bar for the old mural, but didn't examine these photos til after I had visited. I have now used this title at least twice in previous blog posts, but not on this blog, so no matter. Kara and I and Miss Lola Mae the chocolate Labrador went out on another bicycle jaunt on Sunday. We encountered numerous dogs, of the "hot" and "stray" and "barking like they wanted to rip out our jugulars" types. Here is one that falls under the "hot dog" category, on the side of what I decided was an old whistle stop cafe, as it was set right along some train tracks. If you look closely, you'll see the ghost of what appears to be a hand-painted Community Coffee banner on the building. I know: BFD. It gets better after the jump. Rumors of the Turkish Baths' imminent demise have not been exaggerated. The fiance and I happened upon it in this condition yesterday, a year almost to the day from the first time it caught my eye. See the first post about the place here. This building was the first spark to the interest that became Abandoned Baton Rouge. I was sad to see the old place go, but I'm glad I caught it halfway. And at least now I could look inside...what was left of the inside. On the first day the bf and I came to Baton Rouge back in July to look at rentals, a most intriguing old building caught my eye. 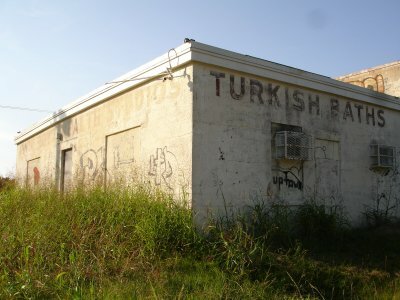 It was an abandoned Turkish Baths/ old-time health spa. It was to become my ABR white whale. I couldn't find it for months after moving here. Not having a vehicle certainly didn't help matters. But recently, I finally found it again, and I believe the area is called Beauregardtown.